It's official: the classical music revolution has arrived. I think there can be no greater sign of this than the advent of the upcoming music festival created by Classical Revolution, a grassroots collective of professional-level, mostly classically-trained instrumentalists across the country. Up until a few months ago, I would have called Classical Rev an "underground" organization. Its presence has mostly revolved around scrappy classical music jams in cafes and other small venues in urban centers like San Francisco, Chicago and New York. But things are definitely moving in an overground direction now. Not only is the upcoming festival going on for several weeks, but it also involves some pretty big venues not traditionally associated with classical music. Yoshi’s jazz club will host the Musical Art Quintet and Quartet San Francisco on September 9; on September 11, the Bay Area's most prominent folk venue, the Freight and Salvage, is staging a concert featuring trumpeter Erik Jekabson and the Musical Art Quintet; plus -- and this is perhaps the most surprising and gratifying news of all -- two big rock music auditoriums, The Fillmore and The Great American Music Hall, will present performances featuring The Classical Revolution Orchestra and guests on September 26 and 27. And here's the kicker: The Bay Area's classical radio station, KDFC, which is known primarily as a purveyor of famous works by big name, commercially successful classical artists and only occasionally delves into less well known repertoire and musicians, is sponsoring the festival. All of the above augers well for the inventiveness and audience-building potential of classical music in these parts. I am excited for the event, which runs from September 7 to 27. 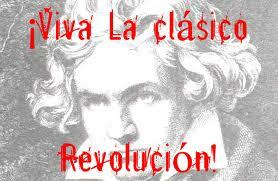 More information about the Classical Revolution Festival can be found here.